Nice! There is hope. Thanks for sharing, as all my plants are covered with six inches of snow--the most we've had all winter. I love Snowdrops! Here it keeps snowing and then melting. I do worry about the plants, as the snow cover helps when temperatures are freezing. But it is nice to see some snowdrops up! Beautiful words for my favourite flower. How I love snowdrops! It is so nice to see something up this time of year! 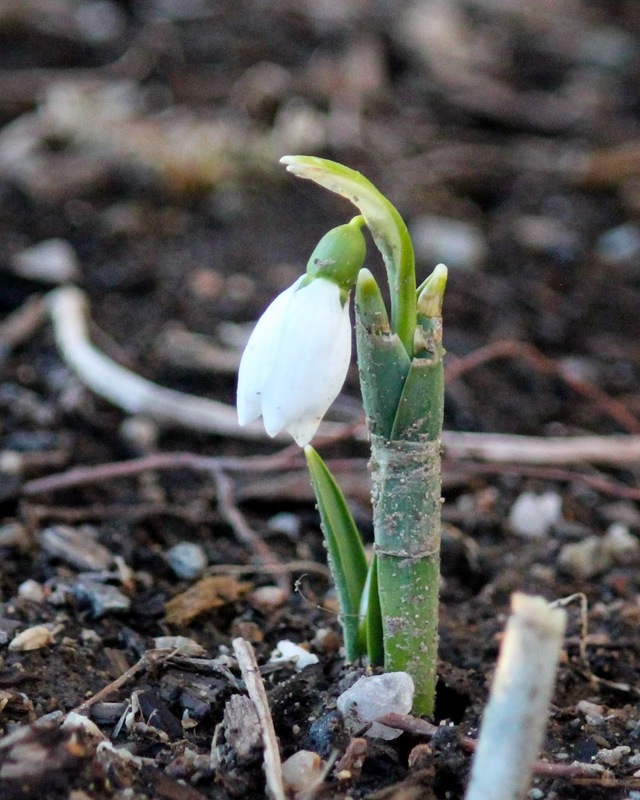 Ah, cold as your Winters may be, your first Snowdrop is blooming before ours. That is surprising! This patch of snowdrops is right next to the house, though, which definitely helps them bloom so early. Herald of spring. A beautiful little flower. Thanks, Lucja! Snowdrops like these definitely helps us wait until true spring gets here. You guys always do have much more snow than us! These snowdrops are a rarity in the garden, though, as I cheated by putting them right next to the southern foundation of my house. They are much warmer than the rest of my garden, which is still frozen solid. What hopeful words. I'm banking on an early spring... although you wouldn't guess it looking out the window! Here the temperatures keep teasing us by alternating back and forth. It keeps snowing and then melting then snowing again. An early spring would sure be nice! Nice! Sadly we are getting walloped right now with what could be 20" of snow by tomorrow. Woah, that's a good snowstorm! Here it snowed to cover the snowdrops but then melted again. Winter is such a tease this year here. Stay warm! What unusual flowers! A pretty flower for December 'snow'. I am wishing you rain there in South Africa! They are such sweet flowers. I will check to see if mine are budded this year. So nice to have something that will bloom so early! How sweet! I always am excited to see the first snowdrops; mine are usually buried under a pile of leaves, so when they bloom it's always a surprise to me, as if they popped up overnight. That's quite fun! I'm amazed at how they do come up despite freezing temperatures. Hi India, I love your poem, peaceful, hopeful and promising. I meant to type Indie, not India. Thank you! No problem, I would be surprised if my name didn't autocorrect to India! A snowdrop and a lovely poem on a cold winter day are enough to cheer me up. Almost spring! We've been having spells of spring-like weather, which get me in such a mood to get outside and in the garden! It's almost here!